A short instruction Guide to trade your IMC tokens. Since the Token Store is fully decentralized, we never actually hold any of your funds. However, The Token Store needs to be able to access your ETH and tokens to be able to conduct trades. What this does is generate a new ETH address. The private key to this address is stored in your browser cache and never leaves your browser. To reveal your private key, click the eye toggle on the left. Once the address is generated, you can transfer the ETH or ERC20 tokens you want to transact in to your new ETH address. By entering the private key to your ETH wallet (that looks something like this: 8d408fd8a4c0b2cc01b22637b79261a1752685e08dec2c8d9a46884afdbf039d) The Token Store will import your balances and you’ll be able to trade on The Token Store from your existing ETH address. Your private key is never transmitted to The Token Store! By accessing The Token Store from a web3 service such as Metamask (a Chrome and Firefox plugin) or Brave (a standalone browser), the ETH account you have associated with your Web3 service is automatically attached to The Token Store and all available balances are imported. Note that we strongly recommend using option 3 as it is the most secure way of dealing with your private keys. 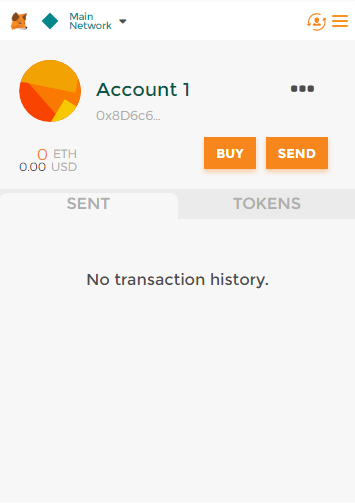 You can confirm you have successfully imported your account by noting, at the top right of the screen, the first several letters of your public ETH address in green, along with the wallet’s ETH balance. Once your account is attached, you must deposit the funds you wish to trade to The Token Store’s smart contract. To do this, you must have funds in your attached account. (If you chose to create a new account, this means you must transfer tokens from yourself to the new account first.) To deposit funds into The Token Store’s smart contract, use the Deposit widget on the left of the page. Once funds are deposited and confirmed (this may take some time), your funds are available for traders. Use the Buy/Sell widget to trade. After you’re done trading, you should withdraw the funds currently locked in the smart contract to your ETH address. Use the Withdraw widget on the left to accomplish this. If you have used a new account, make sure that you have noted your private key somewhere safe!